This small warm-growing Philippine species is a quite unique member of the Bulbophyllum family. 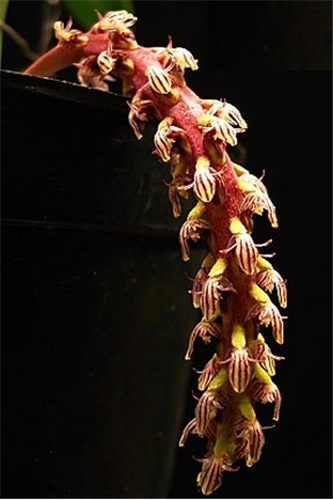 Its spring flowering is produced on erect 4" burgundy-red inflorescences carrying up to 40 successively opening flowers which appear to be peeking out from the rachis. It has been noted that in order to display the inflorescence to its ultimate, this species is best grown mounted. An easy grower under lower light, this is a special treasure to add to any collection !